Have you ever-mixed cement? First, add water to a mixture, stir, pour, and wait for it to set. Sounds simple enough, right? Now, repeat those steps 1,700 times into individual block molds. That is exactly what Seattle couple, Bill and Elizabeth Tracy, did five days a week for a year while constructing their home in Normandy Park, WA in 1956. This was in addition to their full-time day-jobs as engineer and physical therapist. Bill and Elizabeth were personally selected by Frank Lloyd Wright; and in 1955 were given specific designs to build their dream, waterfront home—now known as The Tracy House. Recently, our very own Crystal Soda Blast soda-blasting experts had the privilege of giving some of these blocks a makeover. In an effort to maintain this beautiful 1,150 sf. structure—constructed of concrete, redwood plywood panels and glass—our team of experts were called in to do what we do best—soda blast. 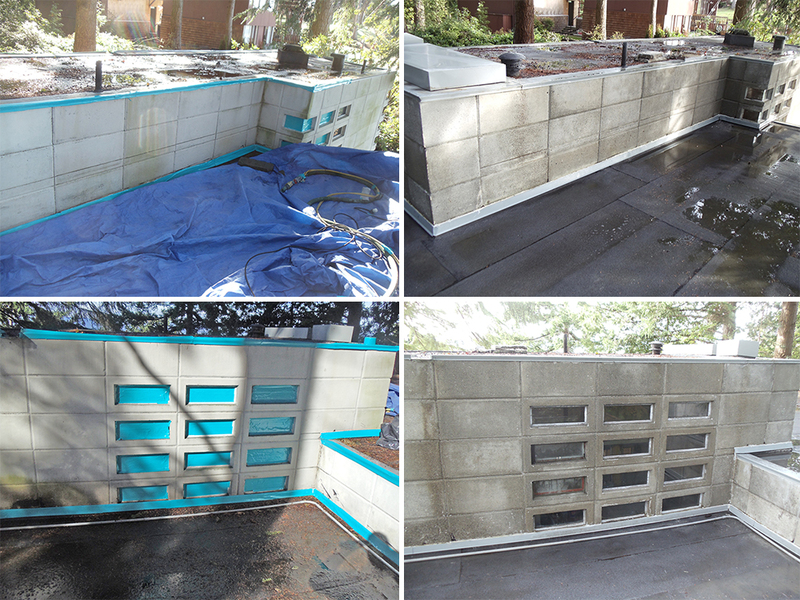 This was an amazing and fun project for us to pursue because not only were we eliminating years of discoloration from the surface of these concrete blocks (outside and in) but we were also given the opportunity to help maintain a piece of architectural history that has made a lasting impact in our beloved Pacific Northwest. Thank you, Larry Woodin, for choosing us as your soda-blasting professionals! UPDATE: The Crystal Soda Blast team has been asked to complete another phase of the Tracy House where, in addition to cleaning the cement blocks, we’ll be carefully removing the paint from select portions of the house. We are honored to be part of the restoration of this historic house. When Do I Need a Professional Soda Blaster?